2013 John Deere 569 Premium round baler, 5' X 6' bale size, Megawide Plus pickup, Diamond Tough belts with plate-type splices, twine & net wrap, 1,000 PTO, roller windguard, hydraulic pickup lift kit, 21.5LX16.1 tires, fire extinguisher, IS0 Bus ready. 2010 New Holland FP230 forage harvester, Metalert III, crop processor, walking tandem axles, hydraulic swing tongue, transport light package, 1,000 PTO (choice of 1⅜" 21 spline or 1¾" 20 spline), 29P finger auger hay pickup attachment, electric controls. One owner; sharp unit that has been shedded and very well maintained. Serviced through shop and field ready. 2015 New Holland Roll-Belt 460 round baler, 4' up to 6' diameter bale, silage special, endless belts, Isobus with monitor, bale ramp, 540 PTO, net wrap, 1.8m hydraulic lift pickup with roller wind guard, 18LX16.1 tires, 5,610 bales, field ready. Very good shape. Excellent used finance options for qualified buyers. 2014 New Holland H7450 Mow Max 13-foot swing tongue discbine, 1⅜" 21 spline 1,000 PTO (can be converted to 1¾" 20 spline), hydraulic header tilt, two-point swivel hitch, safety tow chain, transport lights, Shock-Pro hubs on cutter bar. One owner; all original. Serviced through shop. Excellent. 2012 New Holland H7460 16-foot discbine mower conditioner, hydraulic header tilt, ShockPro hubs, drawbar swivel hitch, 1⅜" 21-spline 1,000 PTO (can be converted to 1¾" 20 spline), rubber conditioner rolls, transport lights, safety tow chain. All original. Serviced through shop and field ready. Used New Holland H7450 Mow Max 13-foot swing tongue discbine, 1⅜" 1,000 PTO (can be converted to 1¾" 20 spline), hydraulic header tilt, drawbar swivel hitch, safety tow chain, transport lights, Shock-Pro hubs. One owner; all original; excellent conditioner rolls. Serviced through shop and field ready. Used New Holland BC5060 small square baler, heavy duty floatation tires, hydraformatic bale tension, manual pickup lift, manual tongue shift, 540 PTO driveline, 72BT hydraulic belt thrower with electric distance control, hydraulic turn thrower with cylinder and hoses to tractor, operator manuals for both the baler and belt thrower. Baled fewer than 2,000 bales; absolutely looks and is like new. Valmetal Model 5600 Agri Chopper, 11LX15 tires with tubes, 102" diameter tub, two large doors to facilitate the loading of big bales when inside farm buildings, the grate that controls the penetration of the rotating knives into the bale is hydraulically adjustable from the tractor seat, blower capable of discharging material 40 feet for bedding sheds etc., requires 70 hp. Serviced through shop and is in excellent condition. Used New Holland 1431 13' swing tongue discbine mower conditioner, 1,000 PTO, 2 pt. swivel hitch, hydraulic header tilt, rubber rolls. Serviced through shop. Clean one owner discbine. Field ready. 2006 New Holland 1431 discbine mower conditioner, 1⅜" 1,000 PTO, drawbar swivel hitch, good original conditioner rolls. Serviced through shop and field ready. New Holland 1431 discbine mower conditioner, standard tongue, hydraulic header tilt, hydraulic swing tongue, good original conditioner rolls, transport light kit, 1⅜ 1,000 CV PTO drive. Serviced through shop and field ready. 2001 New Holland 658 round baler, 4' X 6' bale size, auto twine wrap, 540 PTO, wide pickup, transport light package, manual pickup lift, 31X13.50-15 flotation tires, bale bumper. Serviced through shop. One owner. New Holland 492 9'3" cut haybine mower conditioner, hydraulic lift cylinder with hoses, 540 PTO, new conditioner rolls have just been installed, good cutter bar. Serviced through shop. Used New Holland 664 5' X 6' round baler, auto wrap twine-tie, 31X13.50X15 flotation tires, transport lights, dual pickup wheels. One owner; sold new by Werner Implement. Serviced through shop. Baler has been shedded. Used New Idea 5209 9-foot discbine mower conditioner, dual lift cylinders, hydraulic swing tongue, 540 CV PTO, new knives. Serviced through shop. New Holland 499 12-foot swing-tongue haybine mower conditioner, hydraulic guard angle, 540 PTO pump, good conditioner rolls. Serviced through shop and field ready. New Holland 315 small square baler, 540 PTO, Model 75 bale kicker with manual distance control, hydraulic kicker tilt. Serviced through shop. Used New Holland 166 windrow inverter, right-hand gauge wheel, ground drive, 6-bar pickup, inverter chute. Serviced through shop. New Holland 258 9½' rake, triple rubber teeth, hitch and jack unit. Serviced through shop. New Holland 258 9½' 5-bar rake, ground drive, dolly wheel front axle with new tires, all new steel rake teeth. Serviced through shop and field ready. Used New Holland 166 inverter, 6-bar pickup, left hand pickup wheel, dual drive wheel on right hand side, inverter chute. 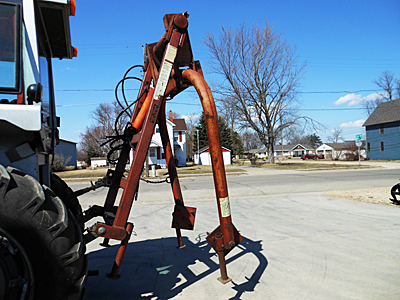 Used New Holland 258 9½' rake, triple rubber teeth, hitch and jack. Serviced through shop and field ready. Used H & S V-8 eight-wheel carted V-rake, hydraulic cylinders with hose, tongue jack, good original rake wheels, one owner. Serviced through shop. Used E-Z Trail 872-W hay wagon, 8-ton E-Z Trail running gear, llL15 tires, 9' X 16' with extension hitch, K&K bale cage with extension sides. Like new condition; always shedded. John Deere 1209 9-foot mower conditioner, 540 PTO, hydraulic lift cylinder, hydraulic swing tongue with cylinder and hoses, equal angle hitch. Used New Holland Model 75 bale kicker, electric tilt & electric distance control with in-cab controller/switch box, stub axle kit, wagon hitch, hydraulic pump/reservoir with hydraulic steel tubing, hoses, etc., large pulley to bolt onto flywheel. All complete. Removed from New Holland 316 baler, original paint/like new condition. Will fit other balers, including 315, 320, 311, 326 and others. Used Frontier (John Deere) 10-foot hay tedder, 540 PTO, manual adjust, safety tow chain. Used New Idea 406 9½' side delivery rake, rubber tines, front dolly wheel/hitch, right hand outer gauge wheel, ground-driven belt drive. Good, clean, original rake. Serviced through shop. Used H & S LK-500 14-foot forage box, three beaters, cross conveyor chain, left hand discharge, P & H wagon gear with extension tongue, 11LX15 flotation tires. Good, clean, straight, older forage box that has been shedded. Field ready. Brady Model 722 two-row stalk shredder, 540 PTO, cup knives, 3" cross cylinder with hoses. Designed to green chop forage or crop residue into wagon or chop and spread residue evenly on the ground. Very good condition. Serviced through shop and field ready. Gehl round bale picker/stacker/unroller, with two cylinders and hoses. Good condition. Used New Holland #80 3 pt. hitch round bale mover. Tines adjustable for 4' up to 6' diameter bales. Faded paint but otherwise in like-new condition. 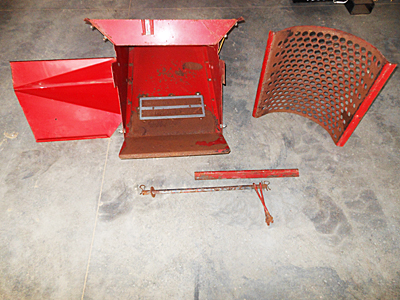 New Holland forage harvester parts, including hopper with magnet and loading hopper. Fits New Holland 770, 782 and 790 forage harvesters.